The Majestic Squire Twist Pens feature a detailed engraved band, a clip with a Swarovski® Crystal inlay, and a cap with an embossed emblem on it. The kits have single 3/8" tubes and streamlined twist mechanisms so they are easy to make. These pens use a Parker™ style refill and are turned on our standard mandrel with the Majestic squire Twist bushings. The gold plated parts on the Premium Majestic Squire Twist Pens are heavy plated 22k Gold and feature a detailed engraved band, a clip with a Swarovski® Crystal inlay, and a cap with an embossed emblem. The Majestic Junior Rollerball Pens are elegant and distinctive. They feature a detailed engraved band, a clip with a Swarovski® Crystal inlay, and a cap with an embossed emblem on it. 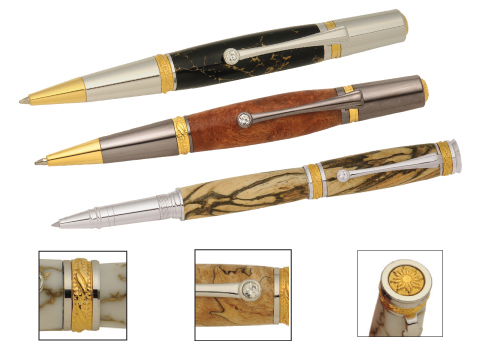 We offer these Majestic Jr rollerball pens in TN and Rhodium (PG) or 22k Gold and Rhodium (PG). The cap on each can be "posted" on the other end of the pen for writing convenience. They are turned on our standard mandrel with the Majestic Jr. Rollerball bushings.